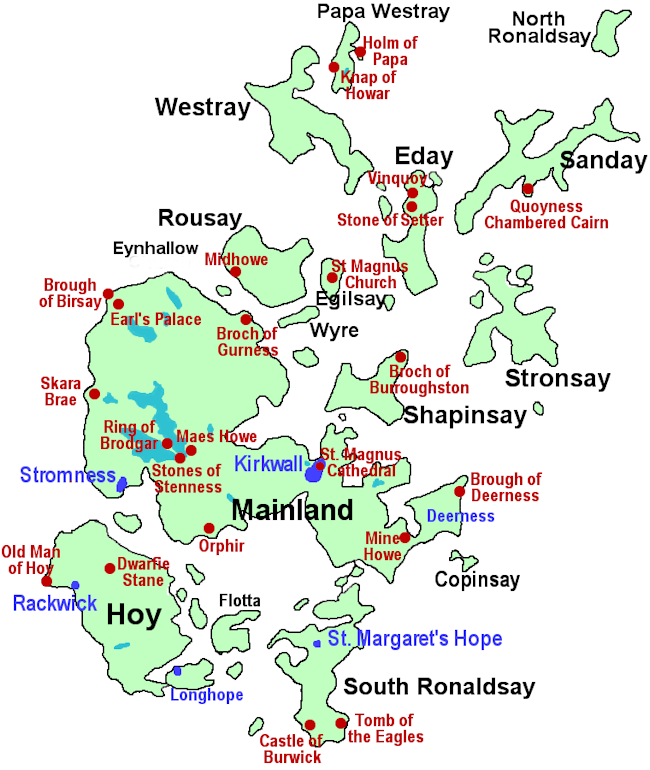 The Orkney Isles, home of Earl Thorfinn the Mighty, are situated off the northern coast of Scotland and are well worth the long trip north required to visit them. No, scrub that last bit - it's hopelessly understated. Orkney is amazing, astonishing, staggering!! If you have the slightest interest in history or archaeology then you must visit these islands because you'll be captivated by them. Few other places on Earth have such an immediate feeling of the history of mankind - of being able to touch and sense things which are truely ancient and yet are also part of today's landscape. Filled with an unbelievable selection of historical and archaeological sites the problem on any visit is what to leave out rather than what to see. And they keep on finding more! We tend to think of the events of King Hereafter as being very old compared to those of Lymond or Nicholas, being nearly a thousand years ago. What is truely astonishing is to realise that many of the archaeological sites were already ancient in Thorfinn's time and places such as Maes Howe and the Stones at Brodgar and Stenness were as much a mystery to the people then as they are to us. Obviously not all of these sites are mentioned in King Hereafter, but no visitor to these islands could fail to be inspired by them or to feel the atmosphere surrounding them. The following is just a very small selection of the best sites. 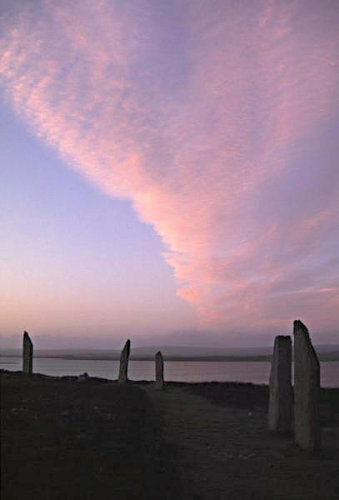 For more photographs of Orkney please visit the Orkney pages of the photography section of my personal site. For a description of the visit that I and a number of Dunnett readers made in June 2001 please visit the Modern Orkney Saga page. The remarkable 12th century cathedral which dominates the island capital was begun in 1136 following a vow made by Earl Rognvald. 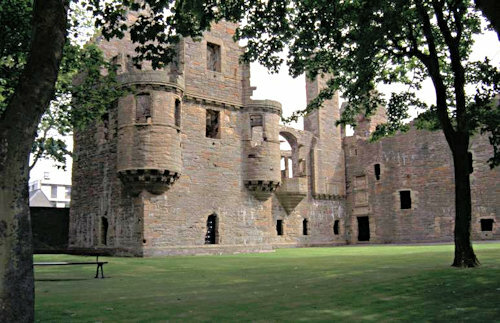 It is a superb Romanesque design which has been compared with both Durham and Dunfermline. Unlike most mainland cathedrals it survived the ravages of the Reformation almost unscathed. It has been extensively restored and preserved - there is a display of some of the structural problems encountered in the nearby museum - and is a truely impressive building, especially when you consider the standard of the housing that must have surrounded it when it was built. There are stained glass windows showing Thorfinn, Groa, and Thorkel Fostrie amongst others. An early 17th century palace which has been described as "possibly the most mature and accomplished piece of Renaissance architecture left in Scotland". Variously 12th-17th century most of the surviving sections date from the time of Bishop Reid in the mid 16th c. It was here that King Haakon died after the defeat at the Battle of Largs off the coast of south-west Scotland. A spectacular and atmospheric henge monument comparable with Callanish and Stonehenge, which is situated on a narrow strip of land between two inland lochs. The circle is 100 metres in diameter and was originally composed of approx. 60 stones of which 27 are standing and another 13 locations are known. The stones are between 2 and 4.5 metres high. Estimates suggest that creating the ditch involved moving over 4500 cubic metres of rock which would have taken about 80,000 man-hours! The remains of another stone circle whose tall angular stones are a commonly used image of the islands. 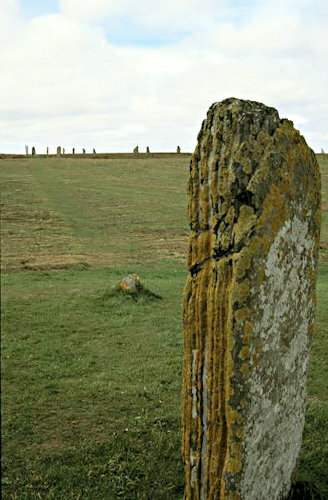 4 stones survive - the tallest over 5 metres - from an original figure of about 12, set in a 30 metre circle. They have been radiocarbon dated to around 3000 BC. 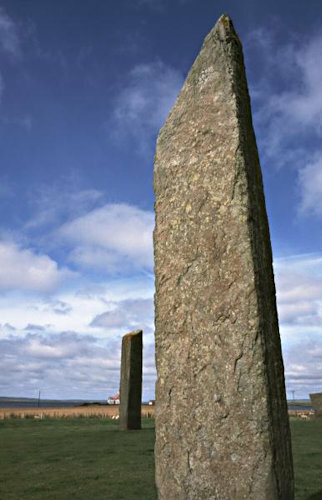 There are a number of single standing stones in the area, including the Comet Stone near the Ring of Brodgar and the Watch Stone near the Stones of Stenness. Sadly the famous Odin Stone, which had a large hole in its centre through which babies were passed and lovers clasped hands in a marriage ceremony, was destroyed by a non-native farmer in the early 19th century. The most recent of the major discoveries, this is not just the most important archaeological site to be discovered on Orkney, or one of the most important in the British Isles - it is one of the most important in Europe. First discovered in 2003, the first major dig took place in 2007 and more has been uncovered every year since then. Despite that they believe that they've so far uncovered only 10% of what's there. The buildings date from around 3,300 BC, predating Stonehenge, and the site has included such surprises as the first evidence of painted stone interiors and the earliest painted pottery. It has been featured in a BBC TV documentary narrated by Neil Oliver, and has been described as a temple complex. It sits between the Ring of Brodgar and the Stones of Stenness. The discoveries being made here are turning many archaeological theories on their heads and analysis of them should reveal far more about the period and boost our understanding of it immensely. This astonishing 5000 year-old stone village was uncovered from the sandhill which had hidden it for thousands of years by a great storm in 1850. Set into the earth the thick drystone walls, which in places are up to 3 metres high, surround houses where everything is made of stone - beds, dressers and other furniture remain in place to give a vivid idea of prehistoric life. A chambered cairn which is perhaps the finest achievement of neolithic Europe in its superbly skilled stonemasonry. The rising midwinter sun shines directly down the 36 foot long entrance passage. It is mentioned in the Orkneyinga Saga and King Hakon's forces broke into it seeking shelter during their visit. It's said that two of his men went mad after they stayed there overnight. 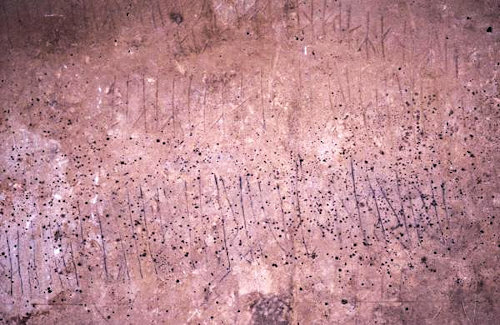 The walls are covered in runes and it has been discovered that one set of them was carved by a man using an axe that was 6 generations old. It is likely that this was the inspiration for the building that Thorfinn and Rognvald fall into after the latter's attempt to kidnap Groa. Excavated by the farmer/owner, after being told that it wasn't of sufficient importance for the expert archaeologists to do so - such was the number of urgent rescue operations on sites affected by coastal erosion - this oval cairn close to the cliffs turned up approximately 340 bodies as well as animals and birds including the Sea Eagles from which the tomb's popular name has been derived. The farmer's family now run a visitor centre where they give talks on the background and some of the finds discovered on the site. There is also a Bronze Age farm on the site where you can see stone cooking pits. The remains of a circular, early 12th century church built by Earl Hakon Paulsson and mentioned in the Orkneyinga Saga. There is an excellent unmanned visitor centre which has an interesting video presentation and a hilarious family tree made by the local children. Brochs or Broughs are a form of circular double walled roundhouse and are unique to Scotland. They seem to have first appeared around 600 BC and gradually developed as fortified towers during the Viking period. 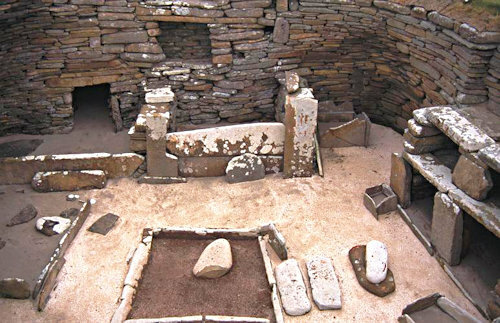 Orkney contains some of the best preserved brochs and some of the most complex examples of building around them..
An extensive settlement on a tidal island that is sadly suffering from extensive coastal erosion. The island slopes towards the mainland and is only 4 metres high at its lowest point, and is completely covered in salt spray during storms and most of the winter. The 12th century romanesque church was originally thought to be Thorfinn's Christchurch but it is now believed that that was in fact where the mainland village of Birsay now stands and that this island church was about half a century later. The buildings at Birsay include one thought to have been a sauna! It is well worth the walk up to the cliffs on the outer face of the island where the views are spectacular and you may see Puffins at nesting time. Ideally situated for sea communications with views across the sheltered sound to Rousay and Eynhallow, Gurness has the most extensive collection of buildings surrounding a broch, including a series of stone slab walled semi-detached houses squeezed into the space between the broch and the outer defenses. These are believed to have been home to as many as 40 families. The buildings include Pictish as well as Viking examples. The broch itself had a water tank in the basement which was fed by a spring. There is a small discrete visitor centre nearby where information can be obtained. 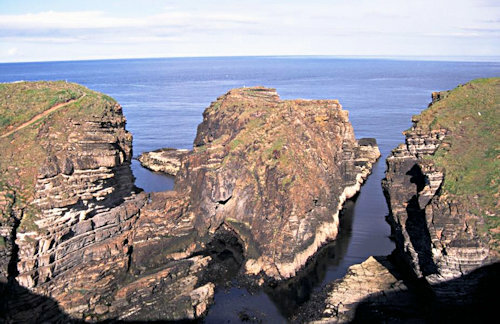 A settlement, which includes the low walled remains of a small chapel, which sits on top of a tower of rock which is split from the mainland cliffs on the eastern side of mainland Orkney. It is reached by a path which drops down to the stone beach before climbing steeply up again with a chain rope for security. The walk along the coast to it includes the spectacular hole known as The Gloop - a deep sea-filled coastal cave of which the roof has collapsed. It is the scene of an important event in the later part of King Hereafter. A 12th century church which was used as a house from the 16th century until it was evacuated in 1851 during an outbreak of fever. When the roof was taken off to make it uninhabitable it was realised that one of the buildings was an old church. It is suspected that there may have been a monastery here before the church was built - Eynhallow means Holy Isle from the Old Norse Eyin Helga. The south-western coast of Rousay which faces the Mainland across Eynhallow Sound is rich in a diverse range of sites. There are 7 brochs in this area of which the best preserved in that at Midhowe, which also has a much older structure. Both are reached from a path down from the road. 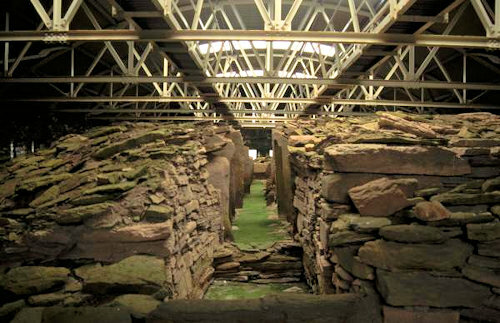 Midhowe Cairn is a stalled chambered tomb, the largest in Orkney, and is sheltered by a large hanger-like building which has walkways slung above the chambers to allow visitors to view them. The bones of 25 people were found in the tombs, which are believed to date from around 3000 B.C. Midhowe Broch is built on a promentory with outer defences on the landward side. This broch is interesting because of the gallery within the wall at ground-level - compared to the usual solid wall base. It has been buttressed with vertical slabs of stone on the north side to prevent collapse. The wall reaches a height of 4.3 m and there is an internal ledge for a first floor gallery of which enough remains to give an idea of the layout. There is also a remarkable alcove near the entrance which demonstrates the superb skills of the stonemason. Among the many artefacts found on the site are some that suggest that both bronze and iron were smelted here. At Moa Ness further down the Westness coast there were discovered both Pictish and Viking graves. The latter contained a number of grave-goods including two oval brooches and a superb gold and silver-gilt ringed pin which became known as the Westness Brooch. Other sites in this area include another smaller chambered cairn at Knowe of Rowiegar and a Norse Hall near the Knowe of Swandro, where there has also been a new site recently (2016) uncovered by the sea and which is being urgently excavated before it is lost to the waves. 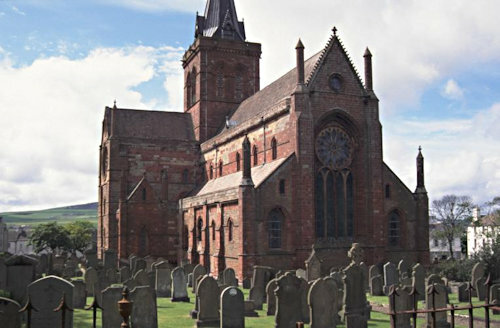 Probably built in the second quarter of the 12th century, this is one of the finest of the early churches in Orkney. Apart from the missing roof it is virtually complete, and was in use until the 19th century. It has the distinctive 15m high round tower at one end, and the doorways and windows were round arches. It was dedicated to Earl Magnus Erlendsson who was murdered here around 1116. 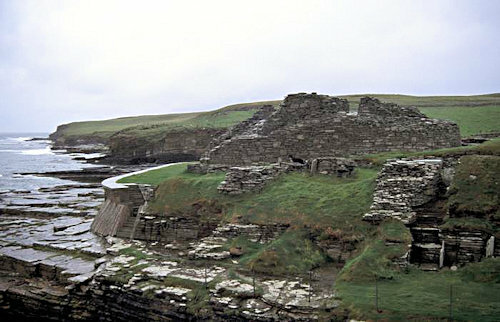 A small stone castle, one of the earliest in Scotland, mentioned in both the Orkneyinga Saga and the Haakoner Saga. It was built in the 12th century by Kolbein Hruga whose nickname would have been Kobbie, thus the modern name. It consisted of a square keep about 8 m across with walls of about 2 m thick. Only the ground floor survives. A 12 century Romanesque chapel, which is roofless but in good condition otherwise. 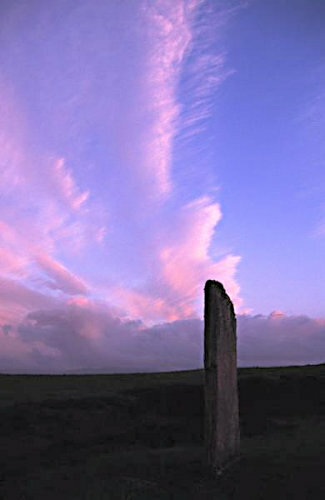 A 4.5 m high standing stone set in prominent position overlooking Calf Sound. 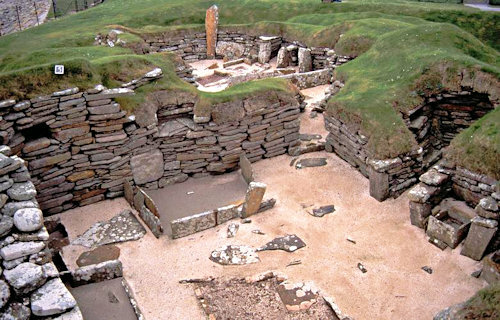 A neolithic farmstead which, like Skara Brae, was covered in sand until excavated in the 1930s. The only rock-cut tomb in Britain, the Dwarfie Stane has a small chamber with two side cells carved out of a large isolated block of sandstone. Two chambered cairns, the southern of which is open to visitors, built essentially to the same sort of design as Maes Howe, but with an oblong enclosing cairn to cover the elongated chamber which is over 20m long, and the 12 side-cells. There are some carvings which are similar to those found in Irish chambered tombs.